Frostgrave anyone? In 15mm of course! Frostgrave from Osprey seems to be the flavour of the month and attracting quite a lot of attention (noticed it even got it’s own board on LAF – I wonder how that works…). After listening to the chaps on Fools Daily ranting about it I finally caved in and ordered a copy – only £10 off Amazon for a pretty hardback you can’t really say no. Should arrive early next week. A few other very notable reviews from the always awesome Delta Vector blog and Anatoli’s Game Room would suggest it’s great fun, lots of flavour but not quite the Fantasy Skirmish game everyone seems to be waiting for. Well, sounds good enough for me. What do you think? 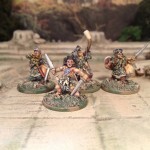 All are Demonworld 15mm Thain (Barbarians with a Celt twist) from Ral Partha Europe. 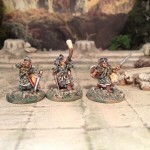 Or pick up their Blighthaven warband and get all the cool character models in one fell swoop. I decided on the tartan after re-reading some Slaine (of 2000AD fame). I don’t talk about rule sets very much – I leave that to the likes of Delta Vector – but I do collect a lot of them. I mean a lot. Mostly Fantasy and Sci Fi, Skirmish and Big Battles. 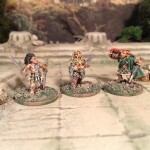 I think I’ll leave the focus of this blog on miniatures though. 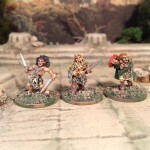 Top job on the plaid on the those Barbarians. Hi Sam. Only just saw your kind comment. Thanks. After doing these I’ve started using a magnifier lamp… I’m pretending it has nothing to do with age and it’s all about the detail. That’s what I keep telling myself as I pear through mine, despite other evidence to the contrary. Besides. You’ve hardly any grey hair. Must be something other than fruit obstacles. Firstly let me congratulate you on a great blog, I have a couple & I know the work that goes into them. 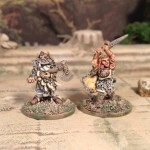 I wanted to ask you a couple of questions about Frostgrave 15mm. I have the rule book, but I’ve never got round to reading it all. 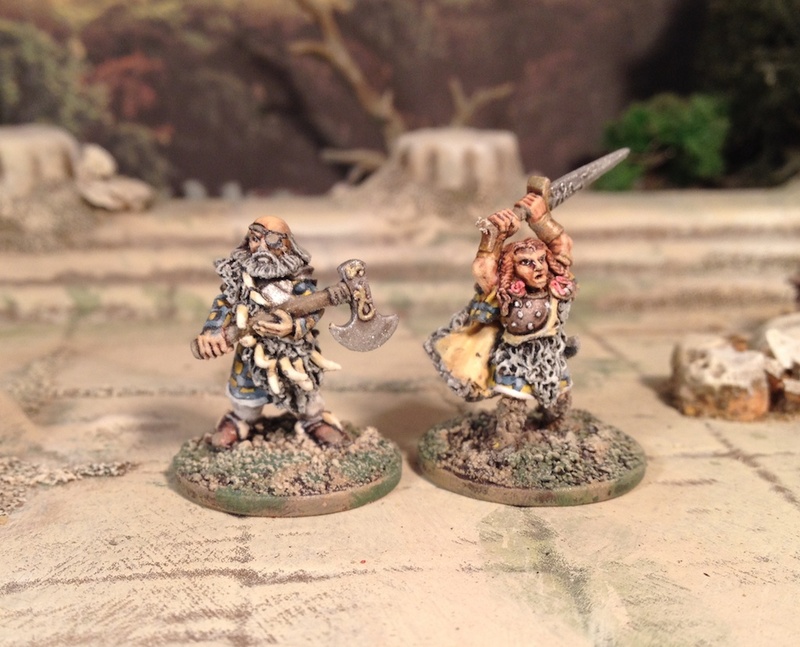 I’m concerned about getting into a new Wargame, when I’m still working on others, but I’m hoping Frostgrave 15mm may be a little easier to get into. So onto the qus, how much terrain is required (where would you recommend I get this from, other than scratch), on what size board & any range changes for 15mm. First off, many thanks for the praise Mickey. 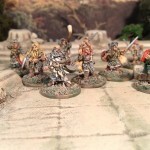 As you know – not many miniatures are needed to play (10 aside plus monsters). Danger is if you suffer from collector-syndrome or not. You may be opening up a floodgate. Table; 2ft by 2ft should do (though the table I use is 2.5 by 3ft). I’d would go with 3ft by 3ft where possible though to give ‘realistic’ ranges their due. Scale: Two schools of thought. Keep as rules state or convert inches to cm. The ‘keep as’ school is really good for shooty games as the ranges appear far more realistic. For games like Frostgrave I’d try the ‘inches to cm’ school first. To be honest, if I had a big 28mm collection (oh, I do) I’d stick with 28s for a Skirmish game like this. If I didn’t, then 15 would be viable for various reasons. My pennies worth. Let me know how you get on and what you decide to do. Thanks again for dropping by and the nice comments.